This comfortable, terraced cottage sits on the owner's arable farm, next to two other holiday properties near Thornton-le-Dale, sleeping four people in two bedrooms. The Barn is a delightful, terraced barn conversion set on the owner's farm, next to two other properties, 1.5 miles from Thornton-le-Dale in North Yorkshire. With two bedrooms, one double and one twin, this cottage can sleep four people. There's also a family bathroom, a kitchen with dining area and a sitting room with an electric fire. Outside, there is off road parking for two cars along with a private patio garden with furniture and an enclosed, communal lawned garden with patio, furniture and BBQ. 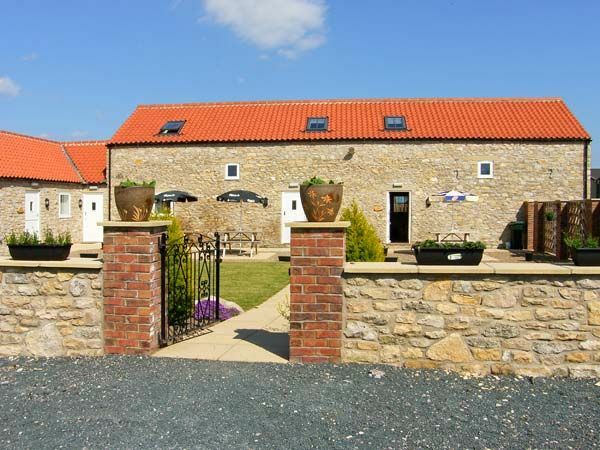 The Barn offers a welcoming base form which to discover this beautiful area, with the North York Moors and the coast within very easy reach. Amenities: Biomass central heating with electric fire. Electric oven and hob, microwave, fridge, washer/dryer, dishwasher, TV with Freeview, DVD, radio, WiFi, selection of books, games and DVDs. Fuel and power inc. in rent. Bed linen and towels inc. in rent. Travel cot and highchair on request. Off road parking for 2 cars. Private patio with furniture plus enclosed, communal lawned garden with patio, furniture and BBQ. One well-behaved dog welcome. Sorry, no smoking. Shop and pub 1.5 miles. Note: There is a small touring caravan site situated 10 yards from the property. Note: This property has a link door to ref. 29723 so can enable groups of 8 to stay together. Town: The beautiful village of Thornton-le-Dale lies just two miles to the east of Pickering within The North York Moors National Park. Much of its charm comes from its complicated shape - a fascinating jumble of streams and paths and pretty houses with an attractive village green which still has its wooden stocks and a market cross. Two bedrooms: 1 x double, 1 x twin. Bathroom with bath, separate shower, basin and WC. Kitchen. Sitting room with dining area and electric fire. Biomass central heating with electric fire. Electric oven and hob, microwave, fridge, washer/dryer, dishwasher, TV with Freeview, DVD, radio, WiFi, selection of books, games and DVDs. Fuel and power inc. in rent. Bed linen and towels inc. in rent. Travel cot and highchair on request. Off road parking for 2 cars. Private patio with furniture plus enclosed, communal lawned garden with patio, furniture and BBQ. One well-behaved dog welcome. Sorry, no smoking. Shop and pub 1.5 miles. Note: There is a small touring caravan site situated 10 yards from the property. Note: This property has a link door to ref. 29723 so can enable groups of 8 to stay together.